1. Wash and prepare the vegetables by removing stems. Cut the asparagus into half – sideways! 2. In a pan, heat 1 tsp of coconut oil and add the slivered almonds. Fry until golden brown (approx. 1 minute). Be careful not to burn them as they burn very quickly. 3. Sprinkle some salt over the almonds. 4. 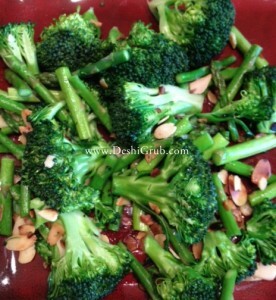 Add the broccoli and asparagus and stir-fry for 2-3 mins. You want them veggies to remain crunchy. And that’s it! Enjoy!